Terry Hara was upbeat and energetic on Thursday night as he kicked off his campaign for Los Angeles City Council District 9. 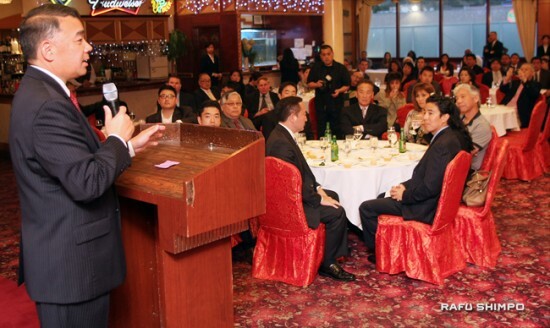 More than 150 attended Hara’s first official campaign event held at Ocean Seafood Restaurant in Chinatown. Hara said that the skills he has developed through his career in the Los Angeles Police Department have prepared him to serve on the L.A. City Council. If elected in March 2013 he would be only the second Asian American to serve on the council. He is commanding officer of the Personnel and Training Bureau, and as a deputy chief, is the highest-ranking Asian American on the force. “I bring in change, and I collaborate and network. And through those efforts, we give other people opportunity and create an environment where everyone can prosper,” he said. Hara said he has spoken with Councilmember Jan Perry, who is termed out and currently running for mayor. He has also received support and encouragement from his wife, Gayle, and children, Kimberly and Mark, who introduced his father to the gathering. 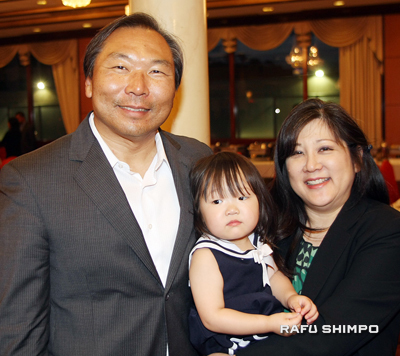 Emile Mack, candidate for Council District 13, with his wife, Jenny Kawada Mack, and daughter, Miya. Among the supporters on Thursday was Los Angeles Deputy Fire Chief Emile Mack. Mack, who is Korean American, announced to the Korean media that day that he will be running for City Council in the 13th District, currently represented by Eric Garcetti. Hara and Mack have followed similar paths to politics, and the men warmly greeted each other after Hara’s speech. Korea Daily reported that there are three Korean Americans running for CD 13: Mack, John Choi and Bonghwan Kim, general manager for the city’s Department of Neighborhood Empowerment (DONE). “People need representation, people need a voice and it needs to be heard. Both Terry and I feel very strongly that our communities may not have had that representation and voice, and we hope to change that for us and for future generations,” said Mack. During the debates on redistricting earlier this year, Korean Americans were adamant in their demand that Koreatown be placed in CD 13, a request that was not reflected in the controversial map approved by the City Council in March. The new council boundaries also removed Little Tokyo from the 9th Council District. “What we hope, even though CD13 only has a small portion of Koreatown but it has a substantive Asian population, from Korean to Japanese, Filipinos, Thais. So there’s a very mixed Asian community, almost 20 percent of the voting population. That’s something very personal to us that we can represent our Asian community in CD13 as well as the greater city community,” said Mack. Mack, adopted from South Korea by African American parents, said he is drawn to the diversity in the 13th district. He also noted that his wife, Jenny Kawada Mack, grew up and went to school in the district. “My background being a Korean orphan, raised in an African American family, all my life around all the ethnicities, Latino, African American, Caucasian, Asian — CD 13 really has that mix there, which really draws me toward it,” said Mack. Speaking to The Rafu afterwards, Hara said he is energized and optimistic as he looks ahead to the rigors of campaigning. He said he chose the 9th Council District because much of his career in the LAPD was spent in that area, including Newton, 77th Street and parts of Central Division. “Countless people have come up and said, ‘We want to help you, we want to volunteer.’ That’s the type of effort that it’s going to take to win a campaign. I’m excited to represent the 9th district and also to bring good change for the people who live there and the people of L.A.,” said Hara.